With roots that date back to 1897, the Perley Rideau is the amalgamation of three care facilities including the Perley Hospital, the Rideau Veterans Home and the National Defence Medical Centre. The three distinct residences – the Rideau, Ottawa and Gatineau – are named for the three prominent rivers in the Nation’s Capital. 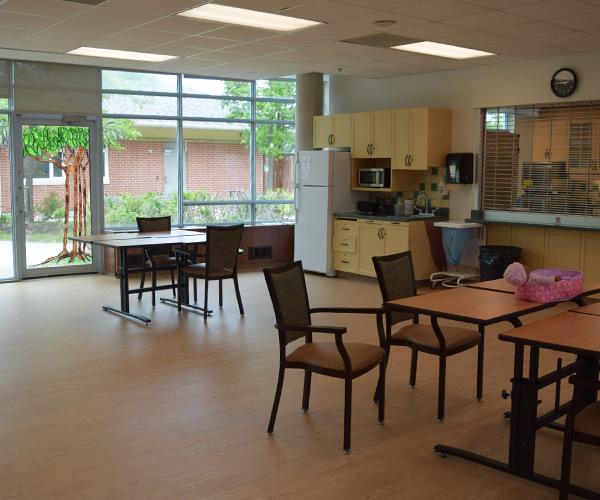 The Perley and Rideau Veterans' Health Centre provides assistance to persons with physical and/or cognitive impairments of varying degrees. An individualized care plan is developed for each resident by the medical and nursing staff in collaboration with the resident and family. The plan is monitored and adjusted as needs and circumstances change. In 2018, Perley Rideau's long-term care was awarded the highest possible standing from Accreditation Canada, earning Accredited with Exemplary Standing. Each private resident’s room is 12 Ft. x 17 Ft.
Windows overlook one of seven courtyards or public grounds of the 25-acre property. Each room is furnished with a bed, chair, dresser, night table, and wall mounted bulletin board. 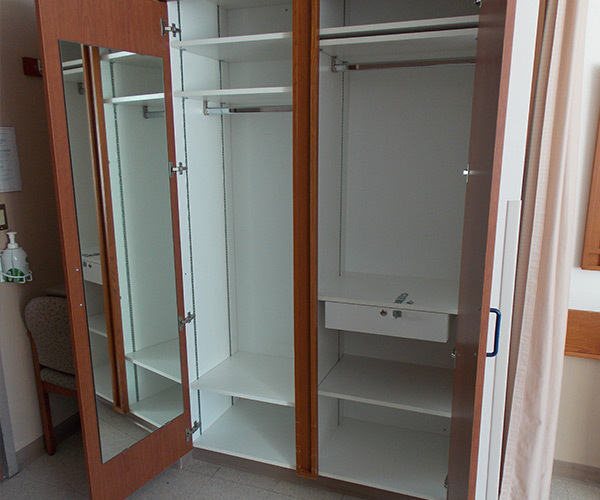 A storage cupboard is provided for personal clothing. Residents are encouraged to furnish their room with personal items, such as a comfortable chair, end table(s), lamps, and pictures and wall art. The number and size of these items must be appropriate to the size of the room and comply with safety requirements. Personal items must be fire retardant and not impede resident and staff safe movement throughout the room or impair the safe provision of care. 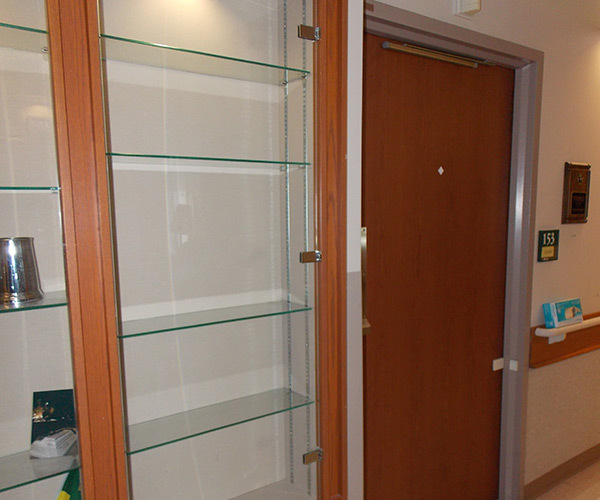 Outside the door of each resident room is a “curio” – a glassed-in display cabinet. This locked cabinet can be filled with items that reflect the resident’s life history including favorite objects, photos and keepsakes. The curios are intended to showcase a life, provide an obvious personal connection outside a room and encourage conversations with other residents, staff, and visitors. Residents are asked to bring a minimum of 7–10 changes of machine-washable clothing, a sweater, rubber soled slippers, shoes, boots and outerwear (for cold and rainy weather). Clothing should be comfortable and easy to put on and take off. Residents provide their own personal toiletry articles including cosmetics and an electric razor. For all long-term care homes in Ontario, including The Perley and Rideau Veterans' Health Centre, admissions are coordinated through the Champlain Local Health Integration Network (LHIN), which provides in-home health and support services, and coordinates the placement of clients into long-term care homes. Once an individual or family decide to move forward with an application, the Champlain Local Health Integration Network (LHIN) will assign a Care Coordinator to guide the applicant to gather the medical and personal information required for admission. The applicant’s Care Coordinator may offer help, if it is needed, in choosing a home. The Case Manager can give the applicant information on wait times for each long-term care home. For Veterans: Within Perley Rideau there are 250 beds designated for qualified Veterans. Veterans Affairs Canada determines the eligibility of each Veteran for admission. Please contact Veterans Affairs Canada for further information on the admission process in long-term care. The process of choosing a long-term care home can seem daunting and be unsettling. The staff and volunteers at The Perley and Rideau Veterans' Health Centre wish to assist in every way. Tours of Perley Rideau are conducted on Tuesday afternoons and Thursday mornings and must be pre-booked. Staff are available to answer questions about care and costs. Tours are booked one month in advance. The wait time to attend a tour can vary. To arrange a tour, please call (613) 526-7170 ext. 2990. Select one of the questions below to see the answer. 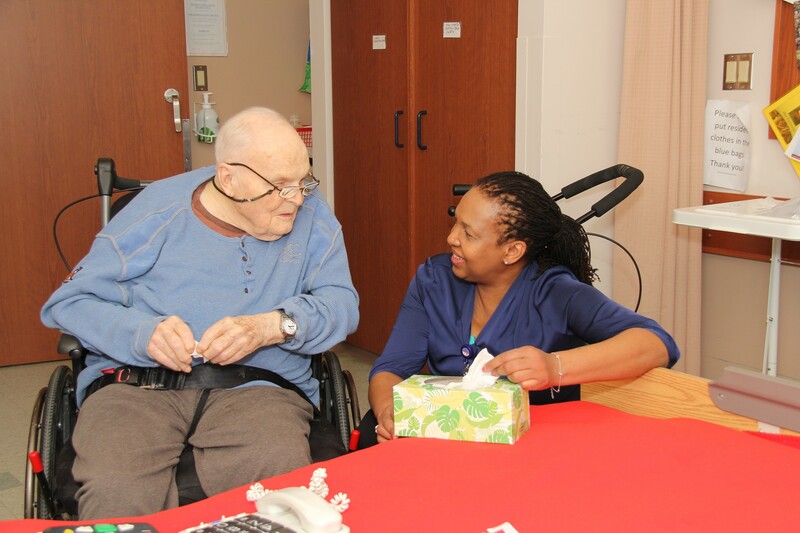 Wait times at Perley Rideau depend on factors such as the type of nursing care the resident requires, the kind of room the resident is waiting for – Veteran or community resident – and the date the resident applied for admission. The Champlain LHIN (Home and Community Care - http://healthcareathome.ca/champlain/en) manages the waiting lists for all government-funded long-term homes in Ottawa. Veterans Affairs determines the disability status of a Veteran and assists with placement in Veteran contract beds. How many people live at Perley Rideau? Our home can offer accommodation to 450 residents which include the 250 beds designated for Veterans. The building is divided into three, two-storey residences. 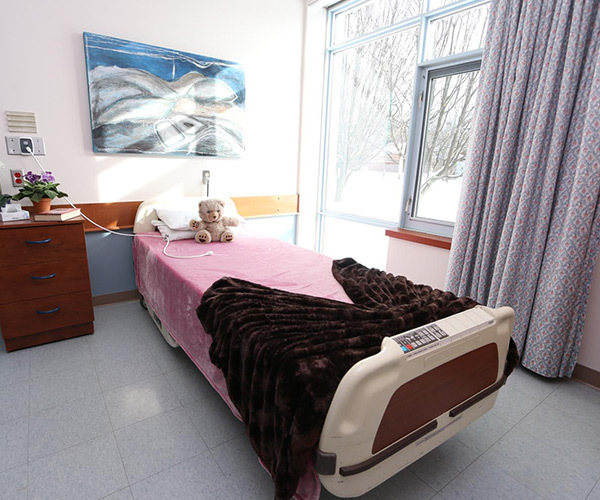 At any given time, 98% - 99% of beds at the Perley Rideau are occupied. Home and Community Care is notified when a room becomes available. The resident’s Case Manager notifies the resident/family when a suitable space opens up. How much time is allowed to accept a bed offer? After the offer has been made by Home and Community Care, the resident and their family have 24 hours to decide to accept the bed offer. After a bed has been accepted , the resident has a maximum of five days (at noon) to move in. What are the rooms like at Perley Rideau? Do Veterans and community residents live in the same areas? All four units in the Rideau building are designated for Veterans along with one unit in the Ottawa building and two units in the Gatineau building. What furniture and personal possessions can I bring? We encourage each resident to make their room as comfortable and personal as they desire. Staff can provide information on safety issues applying to electrical items and safety measures to consider when setting up a room. Resident personal belongings are not insured by Perley Rideau. Residents wanting to retain valuable items in their room should purchase private insurance. Where do I keep my wallet/purse and important papers? Resident and families are encouraged to purchase a lock for the drawer in the room so that valuables can be secured. It is suggested that residents keep all cash in a Trust Account in the Finance Department on the 2nd floor of the Perley Rideau Centre, among the executive offices. Staff can assist those residents who are unable to visit the Finance Department. Is there a bank at the Health Centre? An Automated Teller machine is located across from the Gift Shop on the main floor of the Perley Rideau Centre. Upon request, the Finance Department will set up a Trust Fund account for a resident. The monthly rent, incidental costs - such as barber and hair salons fees - and resident cash withdrawals can be handled through the Trust Fund. How does a resident get to an appointment outside Perley Rideau? Family members are expected to accompany a resident to medical appointments. If family support is unavailable, a request for support can be made to Perley Rideau volunteer services. If volunteer support is not available, families are asked to employ a sitter to accompany the resident to an appointment. Other than daily nursing care, what medical services are offered on-site? What non-medical services are available at Perley Rideau? Comfort Suite: A single furnished bedroom with washroom and shower is available to families needing to remain onsite overnight. This room is subject to availability. * Deborah's Gift Boutique and the Cafeteria accept interact payment and Visa. Is there free parking for families? Each long-term care resident is provided with one free parking pass that permits unlimited in-and-out parking privileges. This policy applies only for our long-term care residents.